New Cheeses from Nettle Meadow - Zuercher & Co. In celebration of summer we’re bringing in three new seasonal cheeses from Nettle Meadow. 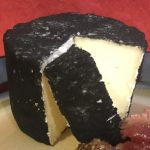 Sappy Ewe, made from a blend of sheep and cow’s milk, gets its “sappy” moniker from its maple infusion and black coating of pine ash. Striking on a cheese plate, Sappy Ewe brings hints of sweet cream, button mushrooms, herbs and earth to the table. Its center is dense and slightly chalking, yielding with age. A light and fluffy combination of cow and goats’ milk, Fromage Frais is fresh, clean and mild. Cows’ milk provides sweetness, while goats’ milk adds a refreshing lemony finish. Nettle Meadow’s high quality milk and ingredients are what really makes this an exemplary fresh cheese. 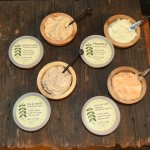 It’s also one of the benefits in purchasing from small artisan and farmstead operations such as theirs. We’re bringing in two new flavors: Blueberry Lemon and Pineapple Cilantro. Like all of Nettle Meadow’s Fromage Frais line, we feel these two use high quality ingredients in good balance, creating a premium cheese in convenient, consumer-friendly packaging. 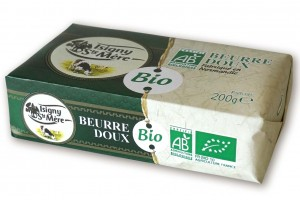 We have just started selling a Bio (Europe’s version of organic) Butter from Isigny. Made with organic cream from grass-fed cows, this butter is cultured and slowly matured, resulting in a silky texture and smooth sweet cream flavor. With an attractive package and approachable retail price point, this new butter has been well-received through our first couple of orders.